Date & Time: 10/17/2018 @ 7:10 A.M.
During the month of August 2018, several victims reported their wallets had been stolen while dining at Thousand Oaks food establishments. The victim’s credit cards were used immediately after the thefts resulting in thousands of dollars’ worth of fraudulent purchases. Financial Crimes Detectives with the Thousand Oaks Police Department began an investigation and were able to ascertain one unknown male and one unknown female were responsible for the crimes. Investigators sent surveillance photos of the suspects to Southern California police agencies and were able to identify the female as Karla Vicencio. Investigators also discovered the suspects were responsible for multiple similar crimes in Los Angeles and San Diego Counties as well as the states of Oregon and Washington. Detectives obtained a search warrant for Vicencio’s residence located in the 18000 Block of Hatteras Street in Tarzana. Vicencio was arrested at the location and evidence related to the crimes was located. 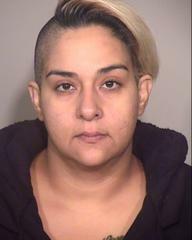 Karla Vicencio was booked at the Ventura County Main Jail for burglary, identity theft and conspiracy with a bail of $350,000.00. Vicencio was also booked for an active Los Angeles County warrant for identity theft. The unidentified male remains at large. The Thousand Oaks Police Department would like to remind residents to secure their purses while dining or shopping and never leave them unattended. Thieves are looking for an opportunity to take your personal items and use them for financial gain. Be vigilant and aware of your surroundings; report any suspicious activity to the Thousand Oaks Police Department.